Thanks for writing Clarinet-Now.com. I didn’t write a checklist like you asked and probably got way too deep in the weeds below, but I hope this article helps you as you learn to double between the clarinet and saxophone. Here is your most important question, “What are the major differences between a saxophone and clarinet embouchure?” You are playing tenor saxophone. One major difference is the size of the mouthpiece and reed. You do not need as much pressure with the teeth or lips to make a sound on saxophone as for clarinet. Usually, a clarinetist’s embouchure is a good deal stronger than what a tenor saxophone embouchure needs, this will cause the clarinetist on saxophone to bite too hard, pinch the sound, and likely make the pitch sharp. A clarinetist switching to saxophone has to loosen some and become more flexible with intonation (adjusting intonation with tongue voicing or minor adjustments to the mouth). However, for clarinetists doubling on saxophone, especially tenor and baritone saxes, you still have to bite enough to hold onto the mouthpiece. You can still test yourself by trying to jiggle the mouthpiece in your mouth (the mouthpiece and reed should be in one firm place, and not moving all over the mouthpiece). A saxophonist doubling on clarinet will have the opposite effect. They are used to less pressure on the mouthpiece and reed. So when the saxophonist doubles on clarinet, the challenge is to build up strength in the clarinet embouchure: Biting a little harder and more pressure from the corners of the mouth to close down on the mouthpiece. Often, primary saxophonists who double on clarinet will have an immature, unfocused, and overall flat sound. Again, that description is one of a clarinetist criticizing a saxophonist doubling on clarinet. The hardest concept of any wind player switching or trying to play clarinet will have is how stable the clarinet embouchure is. For flute, saxophone, oboe, bassoon, and all brass instruments, usually you have to do major embouchure changes for difference notes and ranges. On clarinet, the embouchure is extremely stable. This is not to say clarinetists do not change the embouchure some for intonation, but compared to the other winds, very little. So, my point is this, especially if ANYONE WISHES TO CROSS THE CLARINET BREAK SMOOTHLY, you have to have a stable clarinet embouchure. 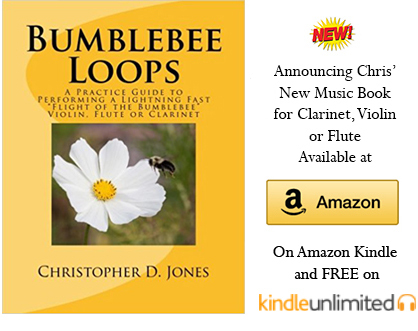 You can read about crossing the break at this link on Clarinet-Now.com, but the basic idea is that the embouchure is firm enough in the lower chalumeau register that you do not have to bite down or lip up more to go to the clarion register. In order to make transitions between those to registers smooth, the clarinet embouchure is stable (no variation in chin or jaw movement, no variation in teeth pressure on the lip/reed/mouthpiece). Another basic difference between the clarinet and saxophone embouchure is the angle the instrument approaches the mouth. Since the bell of the clarinet is usually between the knees, the ligature and reed are closer to the chin than any saxophone with a gooseneck. Often, saxophonists who play clarinet hold the clarinet bell out too far and this can leave an unfocused clarinet sound. HERE YOU'LL VIEW A VIDEO THAT DOES GIVE SOME DECENT INFORMATION COMPARING THE CLARINET AND SAXOPHONE EMBOUCHURE. For articulation between clarinet and saxophone, again you have a smaller and larger mouthpiece and reed. However, because the tongue on the saxophone reed is larger than the clarinet mouthpiece, it does not mean you need to do larger tongue movements for articulation. One of my goals on clarinet articulation is to keep the tongue as close to the reed as possible while the tongue is not in the on position (touching the reed). The tongue strokes the reed very lightly to deaden the vibrations of the reed and make the articulation. Even between legato and staccato articulation you can do with this without smashing into the reed with the tongue. So, for saxophone articulation, my goal is the same. The difference being that the tongue is lower on the saxophone reed tip than for clarinet. On clarinet, I have the tip of the tongue touching just slightly below the tip of the reed. On saxophone, since the reed is larger, the tip of tongue would be lower than the tip of the reed simply because the larger reed is further in the mouth. Make sure you practice both instruments at the same time (no, I do not mean blow on clarinet and saxophone at the same time). Put them both together, start on clarinet and play through some music. Set the clarinet on a peg, pick up the saxophone and practice music. Go back and forth on the different instruments. Your body will learn to adjust to each instrument to the correct embouchure, articulation, tongue placement, and even differences in fingers if you play both instruments like this. I call this “dividing my brain.” When I go to saxophone, the brain goes to saxophone. When I go to clarinet, my brain goes to clarinet. Eddie Daniels is a famous jazz clarinetist. But, he started on saxophone. Also, early in his career he was known best as a saxophonist. He eventually ‘broke-out’ to play jazz clarinet primarily (you can learn more about this in the video below) But, the way he describes ‘doubling’ is this, “you do not ‘double’ on instruments, you ‘play’ instruments.” He is saying that he was not a clarinetist doubling on saxophone, but a musician playing saxophone and a musician playing clarinet. Eddie Daniels says, "I don't consider myself a doubler." See video below. Remember this, the audience is not divided 50/50 into clarinet and saxophonists. The audience might not know the difference in the two instruments. When they see you, they see you playing the instrument you are holding. Play it well, whatever it is.